Ruby, my second baby, and first hypno-baby was born last Wednesday exactly on her guess date (Hypnobabies word for due date)! 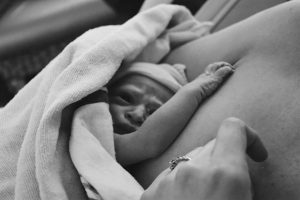 She had been measuring small for several weeks, having something called IUGR, or Intrauterine Growth Restriction. I had been having NST’s done twice a week, along with an extra ultrasound to check placenta and cord health about three weeks before her guess date. I go to a practice where I see many midwives and doctors, not being assigned any particular one. 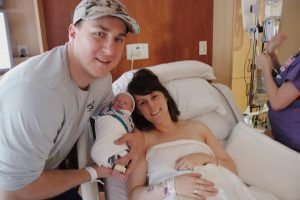 They were recommending early induction, about 6 days early to be exact. This made me stressed because I wanted everything to be as “normal” as possible with my first hypno-birth. But my gut feeling told me she was strong. She always moved and kicked very hard, and all her NST’s went well. I just didn’t think she needed to come out early. So, I was able to get the docs/midwives to agree to push the induction date to the day after my guess date. This meant that I was REALLY hoping she would come on time, and I wouldn’t be pressured into an induction. Saturday night, a few days before my Wednesday guess date, I started having pressure waves (Hypnobabies word for contractions). This was different than with my first baby. 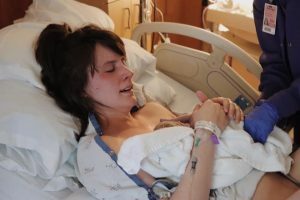 With his birth, it started by my water breaking, then waves coming gradually on, and his total birthing time (Hypnobabies word for labor) was about 12 hours. I wasn’t sure if this was it, or these were just warm up waves. I had about two an hour all night, and they weren’t hard to manage, but they just made sleeping difficult. I listened to a few hypnosis tracks to help me stay calm and relaxed. Sunday morning came and the waves almost went away completely. But I was exhausted, so I slept most of the day. This pattern repeated Sunday night and Monday night, but each night the waves got stronger. Then, Tuesday night, the waves got pretty strong and I sort of hummed through a lot of them. Wednesday morning, guess date, I didn’t know what to do. Every time I walked around, it felt like I was having a permanent wave. When I would lie down, they would die down a little. So, my husband and I decided to go to the hospital just to check. I listened to Easy First Stage (Hypnobabies main birthing time hypnosis track) on the way to the hospital and had it on through check-in. I really could NOT tell where I was at! Was this it, or was I imagining it? Would it go on for hours? I just felt so unsure! But I was calm through it all, managing waves was easy, and I felt like things would be okay. They checked me and I was dilated just to a three, but that didn’t bother me. They wanted to keep me because I was supposed to get induced the next day anyway. They also wanted to start me on Pitocin because they thought I wasn’t in my birthing time at all. And they mentioned breaking my water later that day if I didn’t progress. I agreed to start Pitocin on the lowest dose and I felt okay with that. 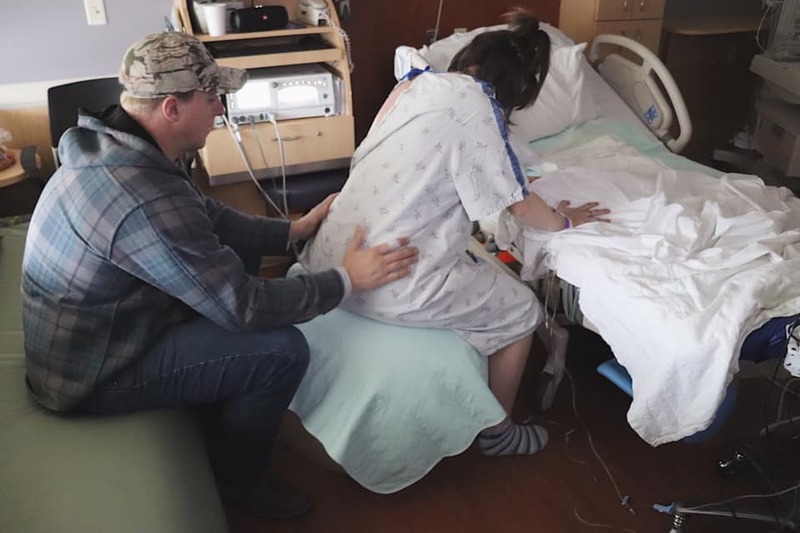 We had gotten to the hospital at about 9:30, and my husband, doula, and I had just been chilling for a couple of hours, talking, and I was listening to my Easy First Stage hypno track and would stop talking and concentrate to get through the waves. They called the nurse in and I stood up from the birth ball and my water had broken! I got on my hands and knees on the bed and the waves were so intense, I had to push, my body was just doing it! The midwife helping with my birth just wanted to be sure I had progressed all the way to a ten, and so I flipped around really quick for her to check and sure enough, I was a ten. I’m still so amazed I had gone through transformation (Hypnobabies word for transition) without even realizing it! So now it was push time, and while the waves felt intense, my body was just doing it and it did not hurt! I was loud through them though, lots of groaning and very loud ahhh-ing. Sometimes I had a hard time relaxing. I should mention that someone had turned on my Pushing Baby Out track (Hypnobabies special hypnosis track for pushing), and while it was playing, I would hear the reminders and it helped me get through! I’m not positive I was in hypnosis (she was!! ), but I AM positive that Hypnobabies got me through everything amazingly well! I pushed for about 35 min, at first on hands and knees, then flipped around to my back and pushed her out from there. There was burning as her head was crowning, but it actually wasn’t bad, just uncomfortable. The whole thing was fast and intense and amazing. And then she was out and she was small only 5 lbs. 3 oz but healthy and pinked up instantly! I got her right on my chest and had the beautiful experience I felt like I had missed out on with my first baby. It was only 3:23 in the afternoon, making our time from getting to the hospital to birth less than 6 hours, which was great! Thank you, Hypnobabies, and I can’t wait to use it again for future babies! !